Kohlrabi, that crazy looking bulbous vegetable with large drapey leaves, is at its peak right now. It tastes like a blend of cabbage and turnip, and its name means precisely that — Kohl = cabbage and Rabi = turnip. You can throw it in a salad, or cook it like you would turnips or cabbage. The greens are similar to collards and can be prepared the same way. For those on an ultra-low carb or paleo diet, you can blanch the leaves to soften them, and then use them for wraps. Kohlrabi started getting harvested in mid-November. It was the mystery dish at farmer Margie Pikarsky’s Thanksgiving Day dinner at the barn. 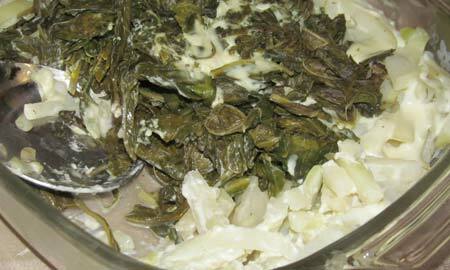 Guests were trying to identify the light colored chunks, covered with sauce and chopped greens. Potatoes? Nein. Kohlrabi? Ja! 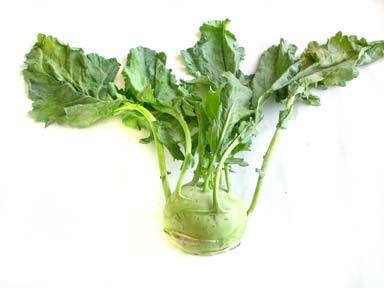 Give thanks for that unusual German brassica that was a favorite of Emperor Charlemagne. At Thanksgiving dinner, Margie recounted the tale of when she and her family were traveling in Germany one summer a few years ago. Late in June, they found themselves in the southwestern corner of the country somewhere near Weisbaden. “Imagine a small urban, self-contained neighborhood about six blocks wide, surrounded by farm fields,” she described. She didn’t remember the name of the town, but she did recall the name of the B&B — the Black Eagle — where they stayed the night. For dinner at the restaurant down the street, they ate farm fresh food. In the version of this dish served at Thanksgiving, Margie chopped up the kohlrabi tops, sautéed them until tender, and served them with the bulbs. Mmmm tasty, enjoy! If you want more kohlrabi and didn’t make it to Pinecrest Market on Sunday, you can go online and order some at the Bee Heaven Farm web store. 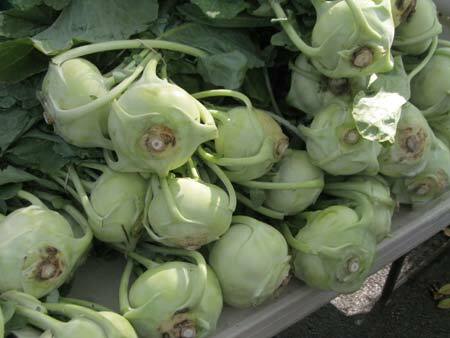 Lots of kohlrabi at market. 1. Place the kohlrabi and 1/2 teaspoon salt in a saucepan. Cover with water, and bring to a boil over medium-high heat. Cook until kohlrabi can be pierced with a fork, but remains firm, about 5 minutes. Drain, reserving 1 cup of cooking water. Place kohlrabi in a bowl, and cover. 2. Place the butter into the same saucepan, and melt over medium heat. Whisk in the flour, and stir until the mixture becomes paste-like and golden brown. Gradually whisk the milk and reserved cooking water from the kohlrabi into the flour mixture, stirring until thick and smooth. Stir in the cream, 1 teaspoon salt, and nutmeg until well blended. Continue whisking until sauce thickens, then cook 10 minutes more. Stir in the kohlrabi, tossing to coat evenly with sauce. 3. Heat oil in another saucepan. Add chopped kohlrabi greens. Cook until tender, and serve with the sauced bulbs. Based on the recipe here.